The English Setter originated in England over 400 years ago as a trained bird dog. This dog breed was bred to hunt and track upland birds, like quail, pheasant, and grouse, over long distances. The appearance of the modern English Setter is thanks to two Englishmen, Edward Laverack and Purcell Llewllin, who developed strains of the breed during the 1800s. The first English Setter came to the United States in 1874. It was one of the first dog breeds recognized by the AKC upon established in 1878 and is part of the Sporting Group. The English Setter is a responsive, energetic, intelligent, and friendly dog breed. They have a sweet nature, gentle disposition, and can have a mischievous side. Their loving and affectionate nature tends to make them excellent companions and family pets. They also get along well children and other dogs. They were bred to hunt and track small animals, so they have a high prey drive and urge to chase. They can get along well with other pets if they have grown up together or have been introduced to them properly. They tend to be excellent watchdogs as their instincts keep them alert, but they do not tend to make good guard dogs as they are more interested in meeting and making friends. English Setters are moderately adaptable dogs. They are best suited to homes with securely fenced-in yards where they can run off-leash. They do not tend to be a good fit for apartment living. They can adapt to apartment living as long as they get enough exercise, but this requires the owner to live a very active lifestyle where they are able to consistently give their dog exercise, attention, and mental stimulation. This dog breed does well in almost any climate. As with many dog breeds, they are sensitive to extreme heat or cold. Because they have a lighter structure, you may want to invest in a sweater or coat to help keep them warm when they are outside with you in colder temperatures. These dogs are also sensitive souls that thrive on human attention and company, and they get bored easily, which means they do not like to be left alone for long periods of time. The English Setter is a relatively healthy dog breed. As with any dog breed, there are some potential health conditions to be aware of. With English Setters, these potential health issues include hip dysplasia, congenital deafness, thyroid problems, elbow dysplasia, and allergies. Talking to the breeder about the genetic history of the parents and asking to see any health clearances can help allay potential concerns about the genetics of the puppies. The English Setter is a highly intelligent dog breed. They are sensitive and in-tune with their owners, so they often pick up on things very quickly. Because they are sensitive, they respond best to rewards and praise-based training. Harsh tones or corrections are unnecessary and can damage the bond you’re building with your dog. Although these dogs are highly trainable, they are also high-energy dogs, which means they can get bored easily, sometimes have a stubborn streak, and usually require an owner with some experience owning and training high-energy working dogs. A novice or first-time dog owner can be a good fit for English Setters, but training and obedience classes are recommended to ensure both owner and pup establish a consistent and positive bond during training. English Setters usually have a straight, medium-length coat with a slight wave or feathering towards the end. Their coat is white with overlay markings that often resemble freckles or speckles. They are called belton and can create larger swathes of color along the main trunk of the body. Some common coat colors for these markings include orange, liver, lemon, blue, and tricolor. The English Setter will shed moderately throughout the year with two heavier shedding sessions as the seasons change. Brushing their coat a few times a week is usually sufficient to remove tangles and prevent mats from forming. You may want to increase to daily brushing when they are going through their seasonal shedding sessions as they will shed more during those times. Not only will regular, and frequent, brushing help keep your dog more comfortable, but it will also keep loose fur contained to your brush instead of ending up all over the house. Your English Setter also needs the occasional bath every 4-6 weeks to keep their coat clean. They may need to be bathed more frequently if they’ve gotten dirty on their outdoor adventures with you. In addition to basic coat care, you will also need to care for your dog’s nails, ears, and teeth. As active dogs, the English Setter may wear down their nails naturally. But, you will still want to check their paws and trim or file their nails monthly as needed. This ensures their nails do not get too long and start to make movement painful and difficult. Ears, especially floppy ears, tend to trap dirt, moisture, and debris, which can lead to ear infections. Checking your dog’s ears regularly and carefully cleaning them as needed helps keep your dog’s ears healthy and helps to prevent ear infections. Dental care is so important for dogs, but it is often overlooked, which is why dental disease is one of the most common health issues in dogs. It’s also the most preventable. Just like tartar and plaque buildup causes gum disease and tooth decay in humans; it does the same in dogs. Proper dental care for dogs is all about preventing tartar from building up in the first place, which protects your dog’s gums and teeth. Brushing your dog’s teeth or using an enzyme toothpaste every day is the best thing you can do to prevent dental disease in your dog. You can also supplement your efforts with dental hygiene chews and a special dental care diet. All of these grooming tasks are just part of taking care of your pup and making sure they stay happy and healthy. Getting your Engish Setter used to having their mouth, paws, and ears handled as a puppy and rewarding them during grooming sessions can help make regular grooming a much easier process for the both of you. They can even become positive bonding sessions that your dog looks forward to! 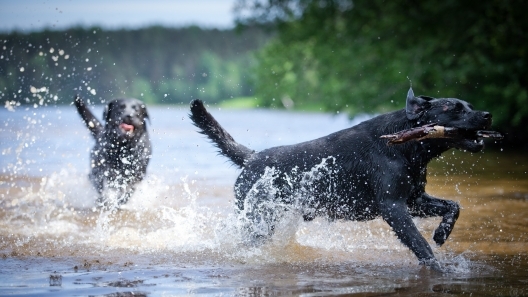 This is a high-energy dog breed that requires plenty of exercise. 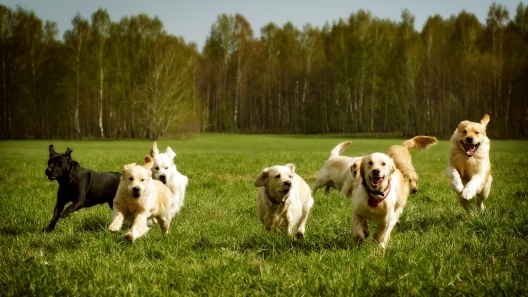 In addition to daily walks, they will require at least one hour of more vigorous exercise every day. In many cases, an English Setter will need more than one hour per day. Although they may act like a couch potato when they are inside, provided they have gotten plenty of exercise already, the English Setter is definitely not a couch potato dog and requires an active lifestyle to stay happy and healthy. This dog will be happy to be doing almost anything as long as it means they will be able to be near you while being active. Their endurance makes them one of the dog breeds that make good running partners for short or moderate distances. They also tend to love water, so will likely be happy to go for a swim. Hiking, trips to the dog park, games of fetch, and more are all great activities to do with your English Setter. As a working dog, the English Setter also needs a job to do. This, paired with their high energy, makes them a good fit for dog sports like agility, dock diving, flyball, field trials, and more. A fully-grown English Setter usually stands 23-27 inches tall at the shoulder and weighs 40-80 pounds. An English Setter generally lives 11-15 years. English Setter puppies are born with a white coat. They may have an eye, ear, or the occasional body patch, but their coat is generally white at first. However, their belton can start appearing as spots and freckles within days of birth and will be random. 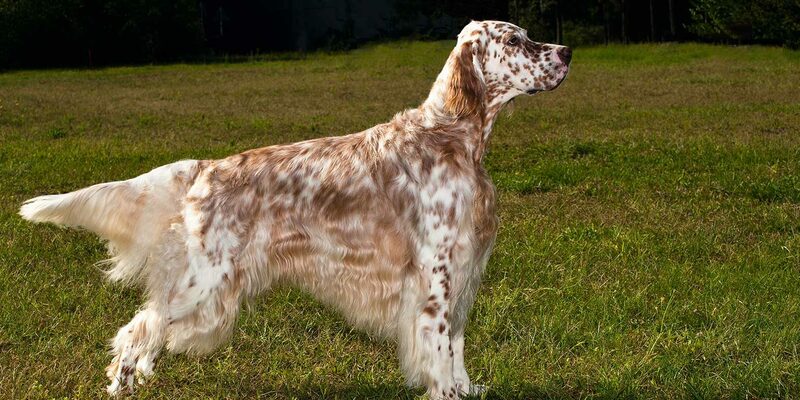 Some English Setters can be mostly white with sparse flecking or they can be absolutely covered, which results in a roan shading with flecks all over.